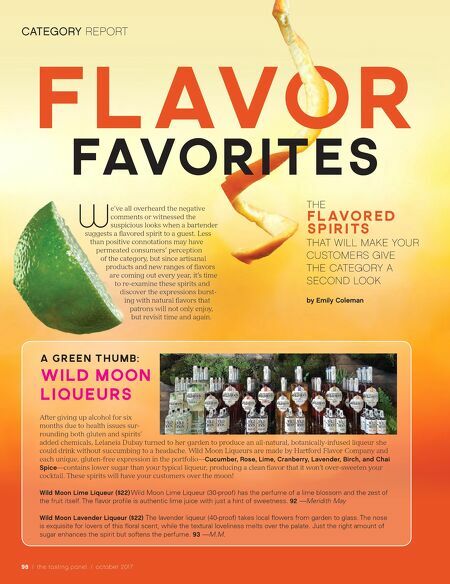 DEPARTMENT HEADER 98 / the tasting panel / october 2017 THE FLAVORED SPIRITS THAT WILL MAKE YOUR CUSTOMERS GIVE THE CATEGORY A SECOND LOOK by Emily Coleman Flavor favorites CATEGORY REPORT W e've all overheard the negative comments or witnessed the suspicious looks when a bartender suggests a flavored spirit to a guest. 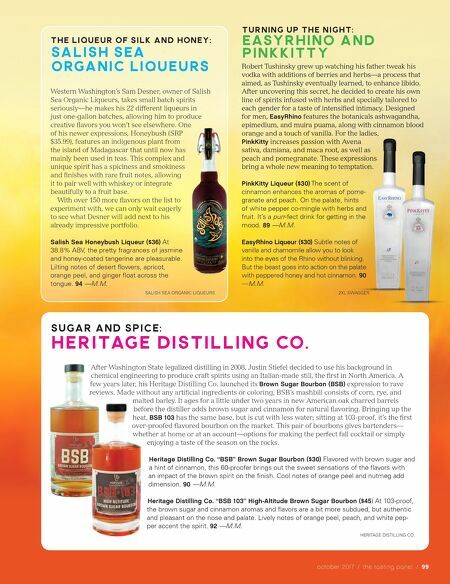 Less than positive connotations may have permeated consumers' perception of the category, but since artisanal products and new ranges of flavors are coming out every year, it's time to re-examine these spirits and discover the expressions burst- ing with natural flavors that patrons will not only enjoy, but revisit time and again. A Green Thumb: Wild Moon Liqueurs After giving up alcohol for six months due to health issues sur- rounding both gluten and spirits' added chemicals, Lelaneia Dubay turned to her garden to produce an all-natural, botanically-infused liqueur she could drink without succumbing to a headache. Wild Moon Liqueurs are made by Hartford Flavor Company and each unique, gluten-free expression in the portfolio— Cucumber, Rose, Lime, Cranberry, Lavender, Birch, and Chai Spice—contains lower sugar than your typical liqueur, producing a clean flavor that it won't over-sweeten your cocktail. These spirits will have your customers over the moon! Wild Moon Lime Liqueur ($22) Wild Moon Lime Liqueur (30-proof) has the perfume of a lime blossom and the zest of the fruit itself. The flavor profile is authentic lime juice with just a hint of sweetness. 92 —Meridith May Wild Moon Lavender Liqueur ($22) The lavender liqueur (40-proof) takes local flowers from garden to glass. The nose is exquisite for lovers of this floral scent, while the textural loveliness melts over the palate. Just the right amount of sugar enhances the spirit but softens the perfume. 93 —M.M.